It's really easy -- and FUN! 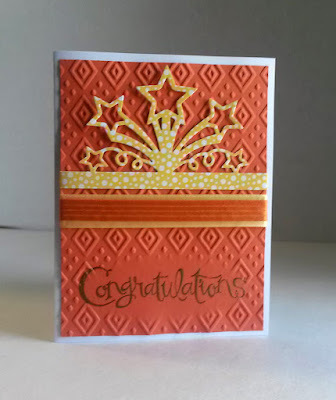 -- to become starstruck on your cards.The Star Blast Edgelits Dies from Stampin' Up!, which can be found on page 11 in the Occasions Catalog, make it incredibly easy to make a card with an undeniably professional touch. A little close-up of the detail you can get with this die. Cutting it from Designer Series Paper gives it extra fun! Do you remember the stars that were diecut from the design on the front? Well, of course, we cannot waste them, can we? I simply added them to the inside of the card to continue the theme. Run a 4" x 5 1/4" piece of Tangerine Tango cardstock through the Big Shot inside the Boho Chic Embossing Folder, using the oval diffuser toward the bottom, so that area is not embossed. Rub the Embossing Buddy over the unembossed area. With VersaMark ink, stamp your chosen sentiment within that area. Cover the stamping with Gold Embossing Powder, and heat to emboss it, tapping the excess powder back into its container. Place the Star Blast Die about 1/4" up from the edge of a 2 1/2' x 6" piece of yellow dotted Designer Series Paper. Cut the stars and carefully remove the cut-out piece. 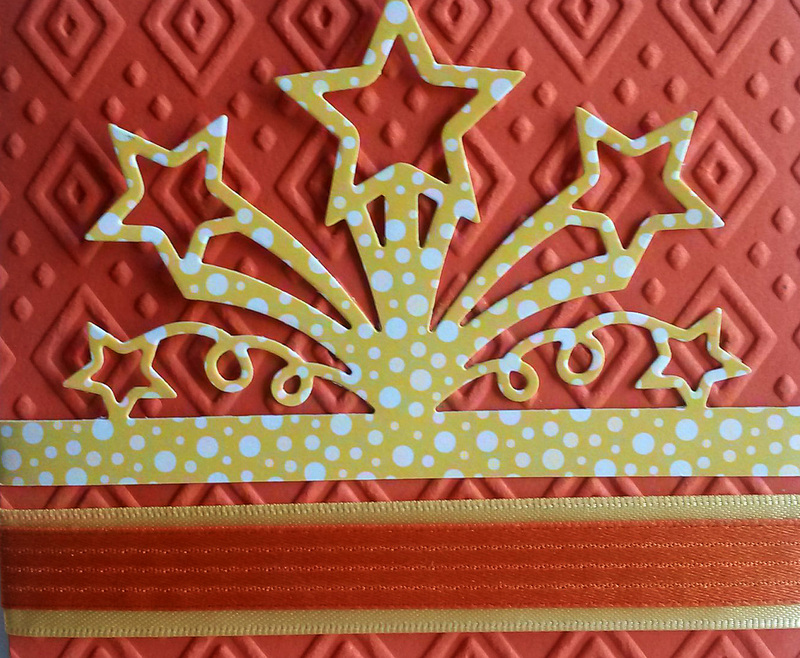 With the top point of the center star almost at the top of the orange piece and centered, adhere it to the card front. Fold the excess strips to the back side of the orange. Tape them in place. Leave just a small gap and add yellow ribbon, followed by the orange ribbon on top, taping the ribbon ends on the back. 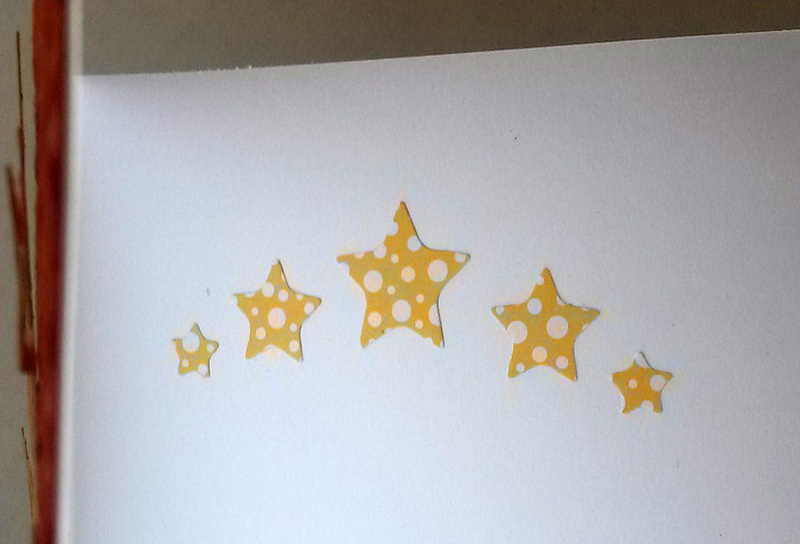 Add the extra stars to the inside of the card. That star die is fun and could be used for so many things. And I like the color combination a lot. Very festive! Makes me think of fireworks. Thank you for sharing at Link It Up Wednesday! With graduations coming up in a few months this is going to be perfect! 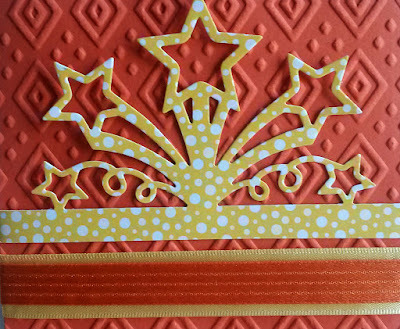 Stampin' Up has the neatest tools to use for the cutest homemade cards. Thank you for sharing your DIY card tutorial at the #HomeMattersParty - we hope you will link up with us again on Friday! Thanks for sharing at My Busy Beehives #beeparty!